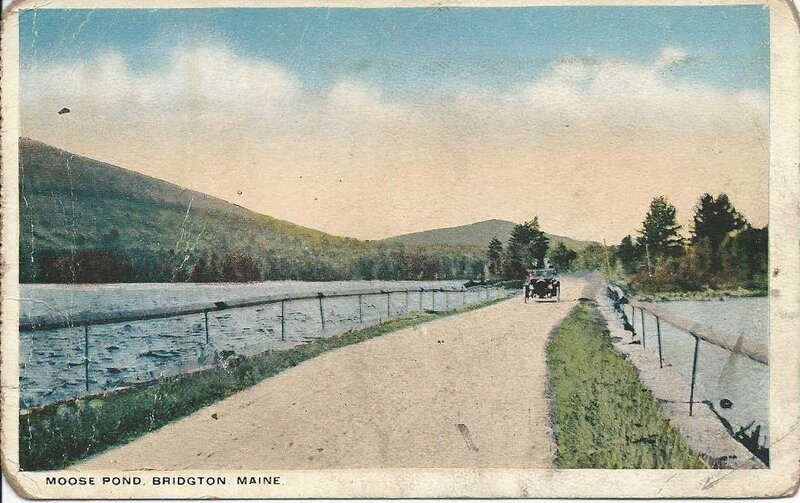 Postcard of Moose Pond at Bridgton, Maine, sent by Ida Knight of Bridgton, Maine, to Frank O. Cole at his military post, Camp Jackson in South Carolina. Ida and Frank were about the same age and were likely schoolmates at Bridgton, before Frank left for military service. Well, Owen - how are you enjoying army life? We miss seeing you in B. but suppose you really are seeing lots of sights & can tell the rest of us a few things when you come back. Best wishes from Ida K.
Ida B. Knight was born at Bridgton, Maine, about November 1889, the daughter of George H. and Emma M. (Trumble) Knight, who were born at Brighton [unless the clerk meant to write Bridgton], Maine, and Denmark, Maine, respectively, according to information on Ida's marriage record. 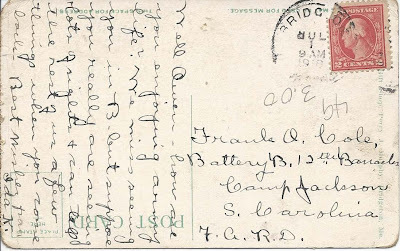 On 4 September 1919 at Westbrook, Maine, Ida B. Knight married Roland Richardson, son of Alphonse and Mary (Brown) Richardson, who were both born at Brownfield, Maine. Roland was born at Chatham, New Hampshire on 28 July 1886. The couple were at Bridgton, Maine, through the time of the 1940 Census. They had at least one child. Ida died in 1979. Roland had predeceased her in 1965. 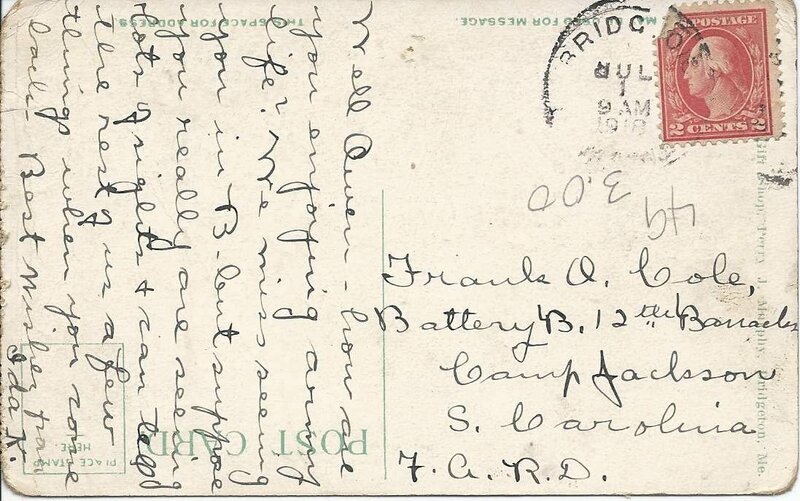 The recipient of Ida's postcard, Frank Owen Cole, was born 8 April 1891 at Sebago, Maine, son of Benjamin Franklin Cole and Alma Louisa (McKenney) Cole, Sebago, Maine natives who moved at some point to Bridgton, Maine. I'm not sure that Frank ever married. He was living in the household of his brother Arthur as late as the 1940 Census of Bridgton, where he was working as a weaver in a mill. He died at Bridgton in 1969. If you have corrections to the information above or additional information, please leave a comment or contact me directly. Thanks!